Unfortunately this is more blatant fraud. 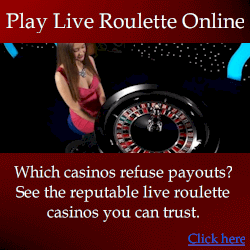 The paragon roulette site (by Jerry Adams) tells you exactly what you want to hear without reservation. 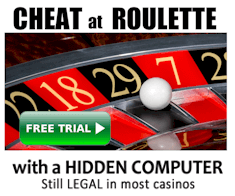 Jerry Adams claims there is a secret bet you can make and that you will earn $15,000 per month and that you can win on absolutely any wheel, including at online casinos. The testimonials on his site are quite unconvincing. I have little doubt they’re fabricated. The paragon roulette system’s so called “secret bet” is simply waiting for a set of numbers to not come up, and then you play a progression. This is nothing new and far from some magical secret bet. I guess people looking for winning systems want to believe there is some “secret bet” which is why Jerry Adams claims that is what his system uses. UPDATE 5th Feb 2007: Jerry Adams now has multiple sites, I assume to deal with the negative feedback from buyers. Despite this review and many warnings throughout the internet, people are still being fooled. I still sometimes receive complaints from his purchasers saying he is not responding when they ask for a refund. I suggest purchasers complain to the payment processor and they’ll force a refund (credit card chargeback). Lack of complaints and complacency is how scams are able to exist. And unfortunately these kind of scams are so common that the authorities are too busy to deal with them. VERDICT: People fall for scams like these because they offer money-back guarantees, but only actually give the refund if a purchaser complains to the payment processor. This is one of the scams I’ve received the most complaints about.